Iran’s incumbent president Dr. Hassan Rouhani, a Shi’ite cleric, is re-elected for his second and final 4-year term as president of the Islamic Republic of Iran. He secured 57% of the total votes cast in the first ballot. His main opponent Seyyed Ebrahim Raeisi, a jurist and Shi’ite cleric, received 38.5% of the votes. Under country’s Constitution candidate needs 50% of the votes to be declared winner. Over 73% of the 56 million eligible Iranian voters participated in the 12th presidential election since the 1979 Islamic Revolution. The Iranian pilots and crew of a British Airways flight who arrived in Iraq on Friday cast their ballots at a polling station set up at the Baghdad International Airport. On Saturday, Russian president Vladimir Putin, European Union’s chief foreign envoy Federica Mogherini, and the ruler of Kuwait Sheikh Sabah al-Ahmad al-Jaber al-Sabah have congratulated Rouhani on his re-election. The Jewish-controlled Western media lead by BBC and CNN have turned Rouhani’s victory into a sign of rejection of anti-USrael statements by Iran’s Revolutionary Guard and Supreme Leader Khamenei. Despite all the Zionists’ glee – the ‘moderate’ Hassan Rouhani, like many Iranian leaders, also believes that only Jihad will liberate Palestine. Iran’s Constitution is based on Islamic Jurisdiction (Shari’ah) with a blend of some of Western moral democratic practices. There are no registered political parties in Iran – and no foreign lobbying groups as exist in the US, UK, France, Germany, Canada and Australia. A candidate with moral misconduct or criminal record or working for the interests of a foreign country (considered treason under Iranian law) or involved in anti-Islamic Revolution activities, is disqualified by country’s election commission. The elected president acts as the head of the executive branch. He has the power to appoint members of his cabinet with the approval of country’s elected parliament (Majlis). However, he doesn’t has the power to veto a legislation passed by the parliament. 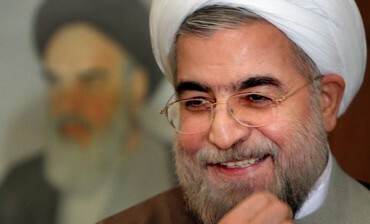 Iran’s president is not the supreme commander-in-chief of country’s Armed Forces. He also cannot appoint judges at Iran’s Supreme Court. Iran’s Supreme Leader, who is not elected by Iranian voters, has the final say in the matters of country’s national security.